Choose a light blue sweater and Armani Junior babys five pocket jeans from Saks Fifth Avenue for your little man for a fun day in the park. Tan boots are a good choice to complement this getup. 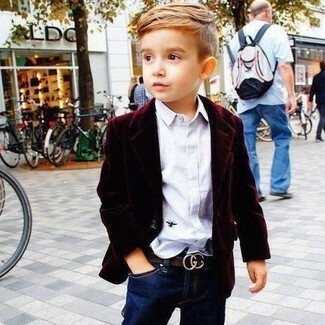 Suggest that your little one opt for a burgundy blazer and Armani Junior babys five pocket jeans for an easy to wear, everyday look. 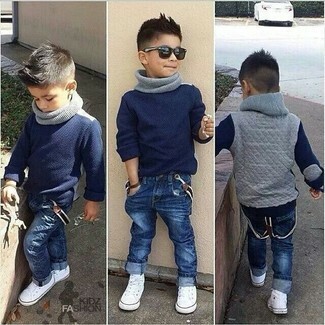 You'll have no problem tempting your little one into wearing this combo of a beige sweater and Armani Junior babys five pocket jeans. As far as footwear is concerned, suggest that your boy go for a pair of beige loafers. 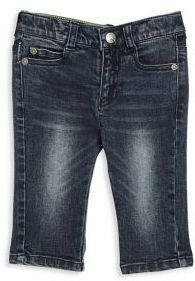 Suggest that your little one team a grey gilet with Armani Junior babys five pocket jeans for a laid-back yet fashion-forward outfit. White sneakers are a great choice to complement this getup. 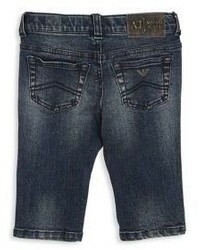 Go for a navy sweater and Armani Junior babys five pocket jeans from Saks Fifth Avenue for your munchkin for a comfy outfit. Complete this getup with white sneakers. 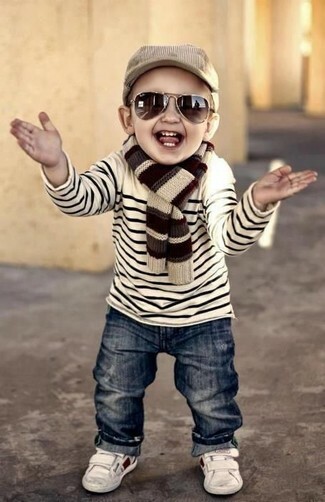 Suggest that your munchkin dress in a white horizontal striped sweater and navy jeans for a fun day out at the playground. 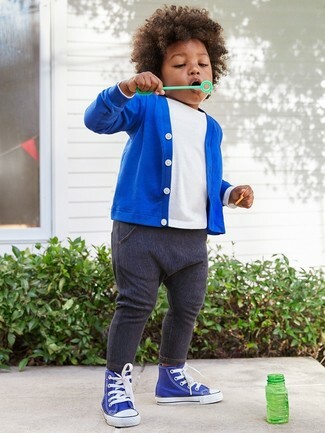 As far as footwear is concerned, suggest that your tot go for a pair of white sneakers. 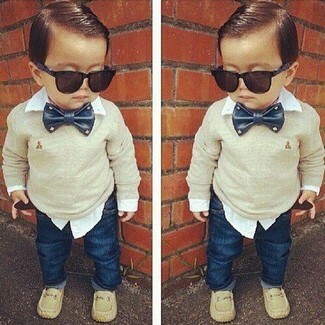 Consider dressing your tot in a blue cardigan with navy jeans to get a laid-back yet stylish look. Blue sneakers are a savvy choice to round off this getup. 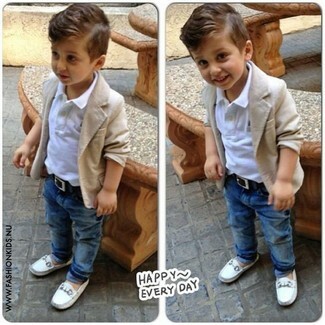 A beige blazer and Armani Junior babys five pocket jeans feel perfectly suited for all kinds of activities with your kid. White loafers are a smart choice to complement this outfit. 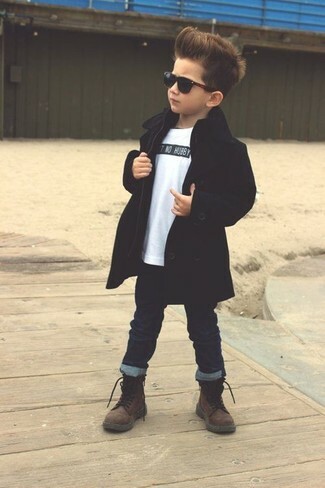 Help your darling look fashionable by suggesting that he opt for a black trench coat and navy jeans. 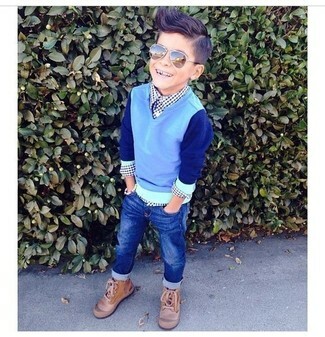 As far as footwear is concerned, suggest that your little guy go for a pair of dark brown boots.